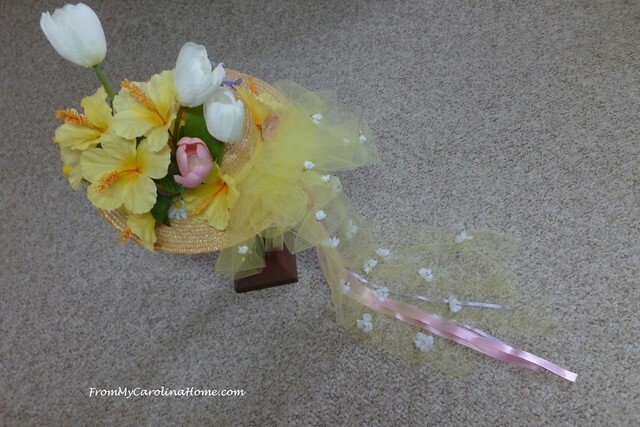 …with all the frills upon it!” Yes, we are doing the Dillsboro Easter Parade again this year with the Mini Cooper club, so I needed to step up the Easter Bonnet from last year. My Spring Hat was cute and went well with the sweater I wore last year, but didn’t have the panache of the ones in the parade. Time for a re-fashioning to a bit more spectacular for the show as we will be in the parade this year. 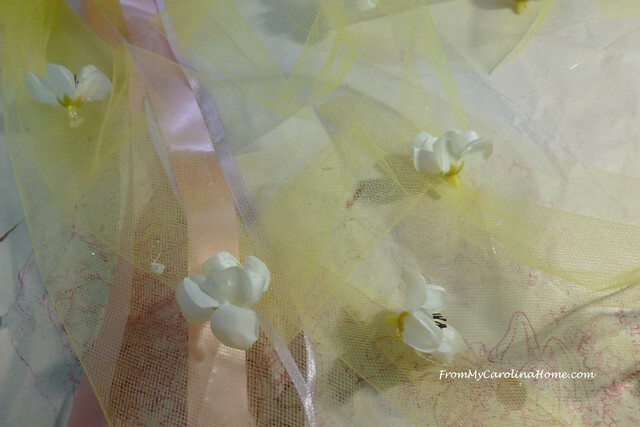 I began by removing the yellow rose and the flowers around the tulle bow, along with the bow too. Then I made a new tulle bow about three times larger. Some ribbons were added as well. Large yellow hibiscus flowers were glued to the left side. I added some tulips for height on the left side around the hibiscus. 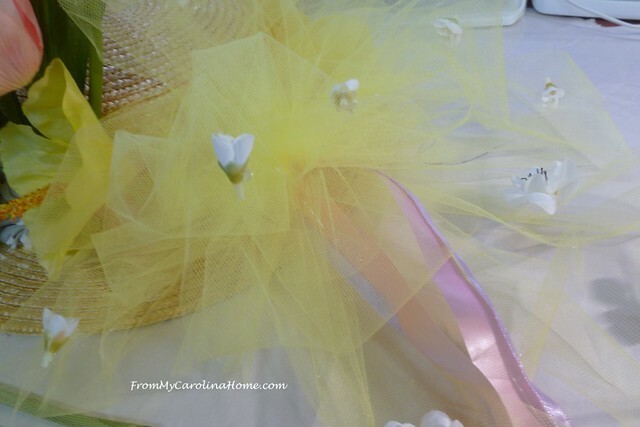 On the tulle, I glued small white silk flowers randomly down the four streamers cascading down from the back of the hat. I put a few on the bow too. A little bird clip is added to the front, and I thought I was done. Big flowers, and a trail of tulle and flowers going down the back, looked pretty good. Here’s the side again with the tulip additions. I put it on an antique hat rack and the more I looked at it over the next two days, the more I thought it just wasn’t finished. It needed a bit of something else. 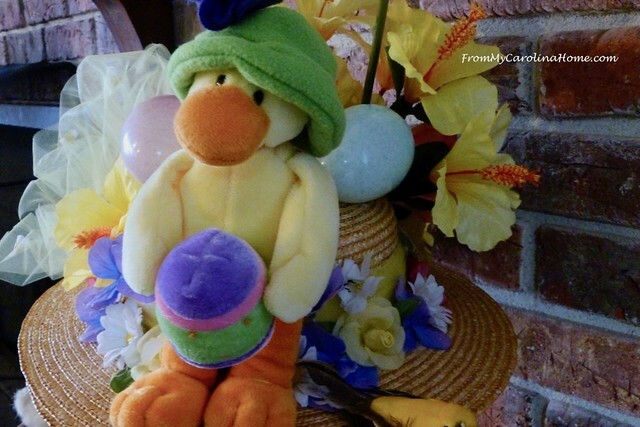 I have two of these adorable little bean bag ducks holding an egg. It seemed the perfect addition, along with some plastic eggs to take up the rest of the available space. I sewed it onto the hat with pearl cotton, so I can take it off later without damaging it. The eggs were put on with hot glue. OK, now it is done!! I think it is finally enough to keep up with any of the hats from last year’s parade. Are you doing any crafting for Easter? 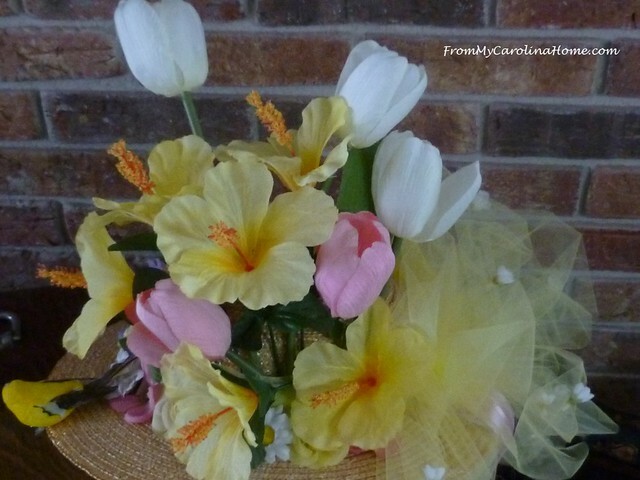 If you use Flickr, I hope you’ll share all your crafty projects inspired by my blog on From My Carolina Home Project Sharing on Flickr , or share in our facebook group – From My Carolina Home Project Sharing on Facebook. Please comment on each other’s shares too, being a part of the From My Carolina Home community is fun! Mother’s Day Gift Shop – Mother’s Day is right around the corner. Whether you want to shower Mom with spring flowers or personalize a piece of jewelry with a special message, Amazon has the perfect gift for every kind of mom. Are we going to get pictures of you in your Easter Bonnet? You are a hoot!!!!! That hat is so much fun. Now that is some hat! Will you add a tie so it stays on your head? I do really want to see a photo of you modeling it. 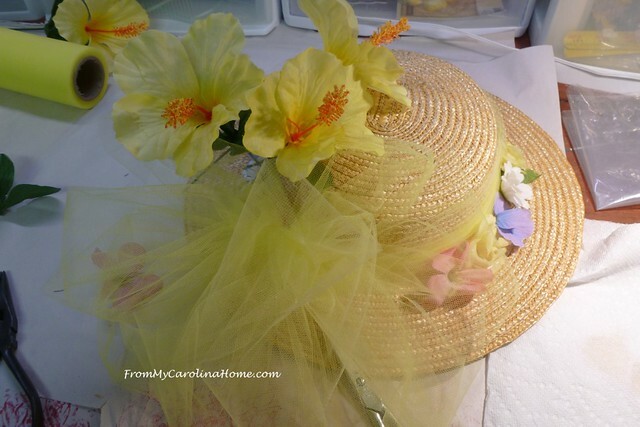 Might be fun to have a photo revue of all the Easter parade hats . . .
Now that’s a winner of a hat! I’m sure you will have a grand time at the parade. I can’t wait to see pictures. Enjoy! Love it….sometimes I long for the days past when folks actually got dressed up for holiday events all the time! This is adorable, Carole! What fun. 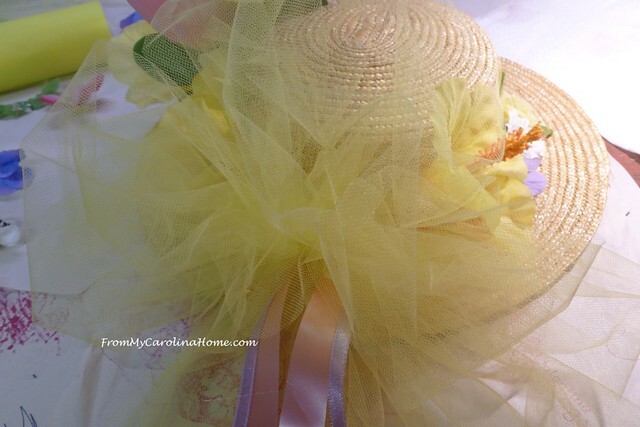 I used to make all kinds of “lacey” hats for decoration, back in the day! LOL Haven’t done that in a while. Now I may have to dig out all my old crafting stuff! LOL Thanks for sharing! 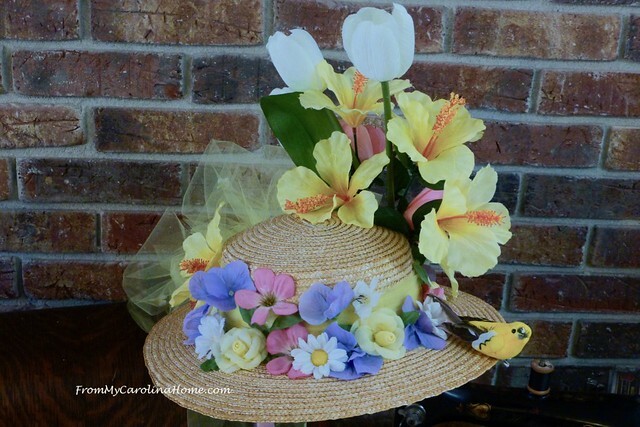 Like the others, I would love to see you modeling your adorable Easter Bonnet. What fun! Your little duckie was the perfect addition. Maybe you could glue netting to the inside, so you could hold it on your head with a big bow around the neck. Looks like you will have so much fun in your parade! Oh my, that is a little “over the top” shall we say. I hope the duckie doesn’t make it too heavy and also that you don’t have any “rain on your parade”. Should be a fun day. 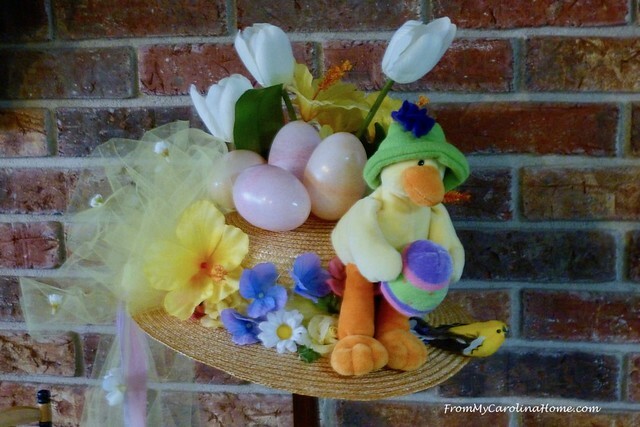 Hello Carole, I am all smiles and giggles at your spectacular Easter Hat that you have created! It is absolutely the most beautiful hat with the perfect amount of humor to make you the Queen of the Hat Day Parade, in my honest opinion! Just like everyone else has requested, please do show us pictures of you wearing your hat. 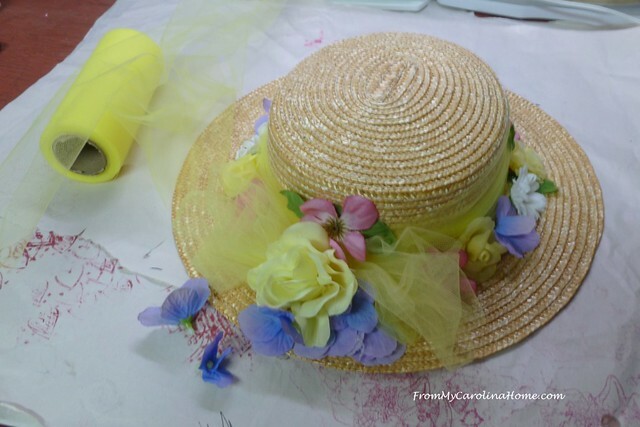 Plus, like quite a few have also remarked that it has inspired them to create a hat of their own and missing the times of the past when women everywhere wore hats on these special events and holidays and were so fun and beautiful. Thank you so much for sharing your sensational inspiration! Have a delightful day! The hat is great! No one’s hat should outshine yours this year. A few years ago, I did one for my granddaughter for Easter, and she loved it. Yes, sometimes I will wear a hat myself. Love your hat. HAPPY and A BLESSED EASTER. Wow, now that’s quite an Easter bonnet!! Have fun in the parade! Happy Easter Carole! TOO cute! have you tried it on to see how heavy it is with the duck and eggs? I love hats, but they make me hot… I have a new hat that is like the 40’s sun hats with the top open, maybe that will solve it! No Easter Parade here sadly…. so will wear my hat on Sunday and think about you enjoying your fellow revelers! 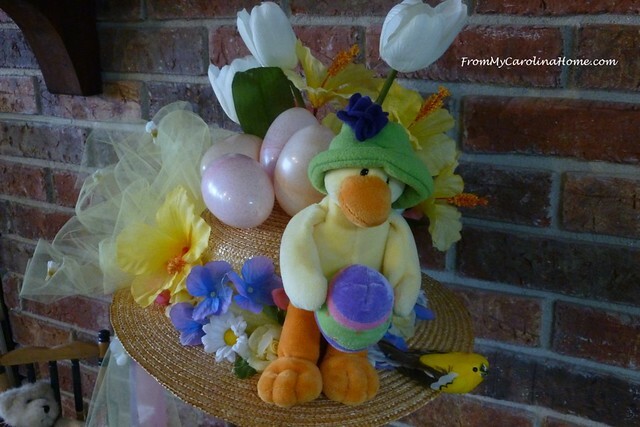 Your hat is just darling and yes, that ducky took it right over the top! I hope you will show us some pictures of the parade and of course, you in your lovely hat! I have trouble getting a hat to fit my big head and lots of hair. I have managed to find a few that fit pretty well. Will have to check out the thrift shops around here. Have a lovely Easter! We had our family celebration and egg hunt last weekend because that was the only date all could make it. Lovely day, got to be out on our newly revamped screened porch. WOW!!!!!! I mean, WOW! I love it! The duck absolutely makes it. This is so much fun!! I bet you will be a hit. Have fun!! 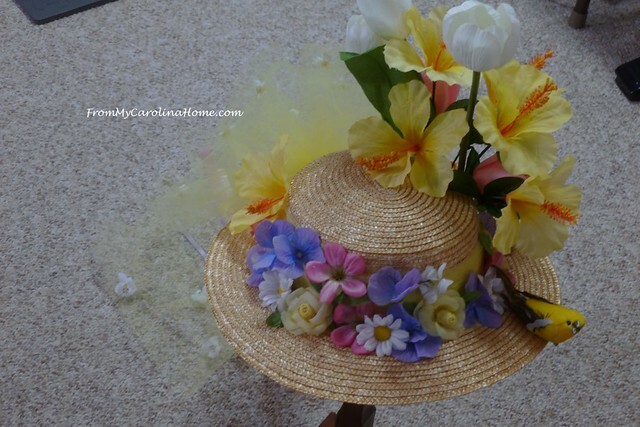 Oh so sweet hat, gave me an idea to make a little hat for the 6 yr old girle across the street to wear during the Easter Egg Hunt. You will not be able to hide in that one. It looks gorgeous and should be a lot of fun.